Shanon Sims describes working with family as the fourth generation of Sims to work on their McFadden, Wyoming ranch. 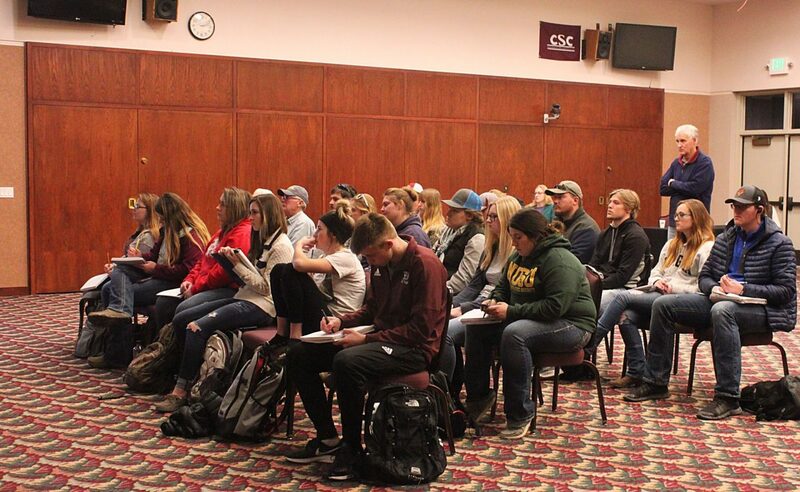 During the UNWNRD Range Day, a large number of CSC students attended presentations between classes to learn more about range health and profitability. 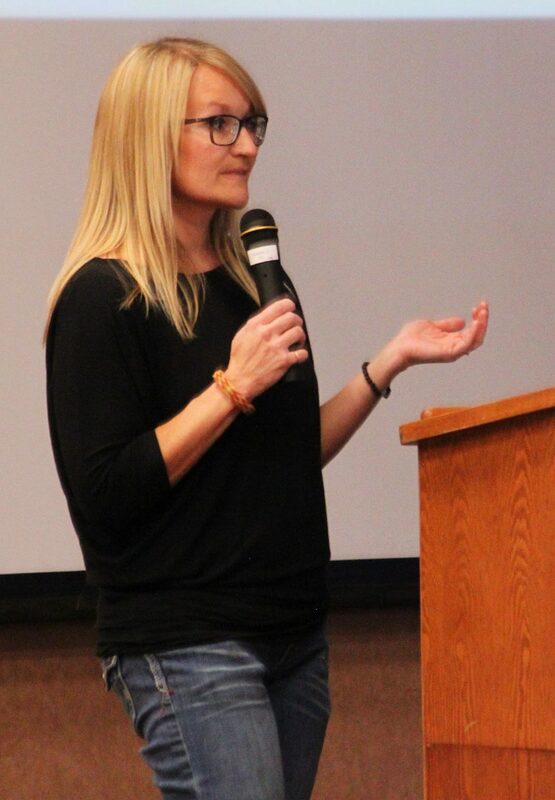 Chadron State College hosted the annual Upper Niobrara White Natural Resources District (UNWNRD) Range Day on Jan. 15 on campus in the student center ballroom. 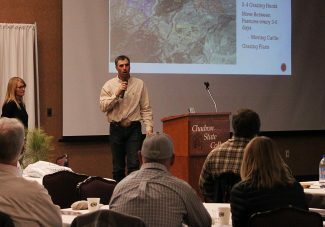 Attended by both students and ranchers around the area, the 2019 Range Day hosted six speakers, as well as two student presenters, covering a variety of rangeland topics. The CSC Range Management Alumni Achievement Award was presented on Range Day, and door prizes such as seedlings, grills, cookbooks and caps were won by attendees throughout the day as well. The day commenced at 8:30 a.m. with coffee and donuts. Tim Buskirk, Jon Griggs, Kristin Dickinson and Aaron Berger presented during the morning session. The first speaker, Buskirk, presented on the recovery efforts on the Pine Ridge Indian Reservation after it experienced severe storms and flooding in 2015. He was followed by Griggs who spoke about the management of range areas near streams and rivers in his presentation on Riparian Management. Next, Dickinson discussed range health and what she looks for in good rangeland through a range health assessment. "Range health has kind of evolved over time," Dickinson said. Range health can also be very technical. 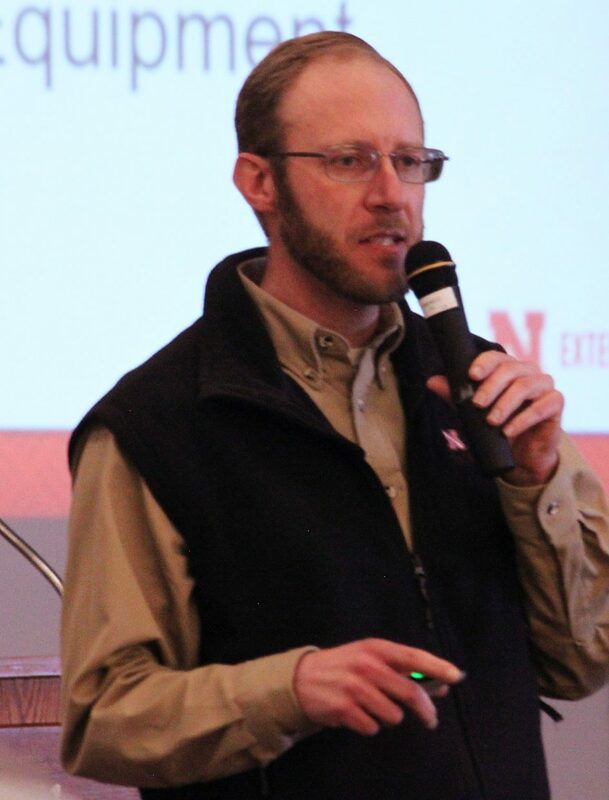 Dickinson spoke about the five basic principles of a range health system assessment: keeping a growing live root throughout the year, keeping soil covered, implementing crop diversity, minimizing disturbance, and incorporating livestock into the range health system. 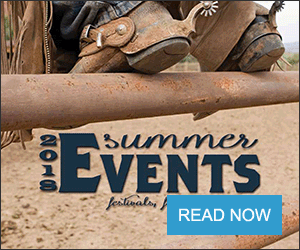 When assessing rangeland, Dickinson looks at three attributes: first, how water, energy and nutrient levels are functioning; second, how rangeland is creating plant matter, and as a result, animal matter; and third, if nutrient levels are cycling properly. A range health assessment can show what needs to be monitored, and also provide a basis to talk to a resource professional to help decide where to make changes. Dickinson was the 2018 recipient of the CSC Range Management Alumni Achievement Award. 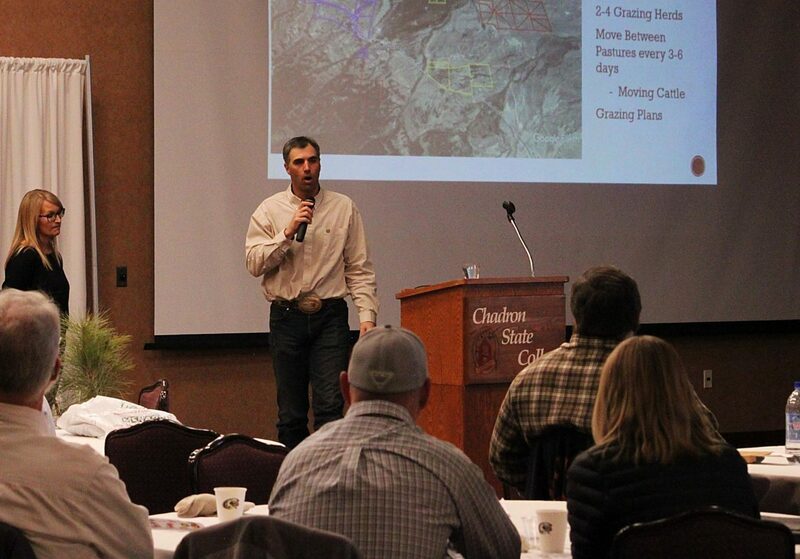 Berger spoke about the costs of ranching in his presentation, "It Costs How Much?" Berger focused on unit cost production from both the farmer and rancher perspectives. "The thing I like about unit cost production is it combines both the cost side and the production side. If I put something into the system, what do I get back? If I pull something out of the system, what does that cost me?" he said. Berger also addressed direct costs and overhead costs, the latter of which don't change much until you have a unit of waiver. 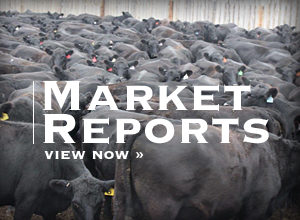 Since market prices control revenue, farmers and ranchers have more control over direct and overhead costs than revenue. It is important to find where value is being created, Berger said. All decisions influence the unit cost production, so Berger recommends saving the records that have value to use for making future decisions. Berger wrapped up his presentation by emphasizing the value of gaining more perspective. "You may be too close to a situation, so get a fresh perspective," he said. He encouraged the audience to speak with successful ranchers and other business owners, bankers, accountants, consultants, extension personnel, and reproductive psychologists, among others, depending on the situation. During lunch, the CSC Range Management Alumni Achievement Award was presented to Julie Wheeler. Don Day Jr., Shanon and Melinda Sims, and the Student Society of Range Management speakers presented in the afternoon sessions. 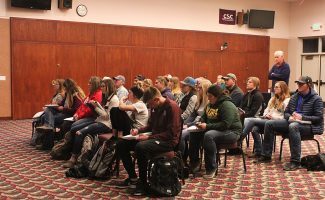 Day talked about the past and future weather patterns to prepare the audience for the weather's effects on rangeland in his presentation "Current and Future Weather." After a short break, husband and wife, Shanon and Melinda Sims gave the final presentation on Rotational Grazing. From McFadden, Wyo., the Sims are the fourth generation to work on their ranch, originally owned by Shanon's great-grandfather, Roy Sims. The Sims discussed the ranch's holistic goals based on the needs, wants and desires. Shanon talked about managing the resources of the ranch by adapting to climates, adjusting cattle sizes, and changing calving dates. Melinda discussed keeping financial records for the ranch. The Sims keep an annual budget and update it every month to judge whether they are ahead or behind. Shanon and Melinda's hope is to develop a family business they can pass on to the next generation.